Lorsque Villa Am Ehrensteig est un bâtiment autonome représentant un 2700 m² de terrain, que nous avons entièrement rénovée en 2015. Les appartements représentent pour les politiques de tourisme un standard 4 étoiles. La villa est située dans le centre de Eisenach, mais la forêt avec de nombreux sentiers de randonnée. Téléphone dans la dt. U dur. dt réseau mobile W-LAN disponible. La maison n'est pas sans obstacle en raison de l'escalier existant (ne convient pas aux fauteuils roulants ou aux assistants). Chaque appartement dispose d'un coffre-fort invité. Das Zentrum von Eisenach ist ebenso fussläufig erreichbar wie die Wartburg. Die Lage der Fewo ist innenstadtnah, sehr schön gelegen. Die Ausstattung hervorragend und wie in der Beschreibung angegeben. Der Kontakt mit den Vermietern hervorragend. Dieses Wohnung kann ich unbedingt empfehlen. Einziges kleines Manko, am ersten Tag war die Wohnung etwas zu kühl. Beautiful apartment with everything travelers could ask for! We stayed in this lovely property for one night, but could have easily spent a week or more there. The apartment is absolutely gorgeous, and has everything travelers could ask for or need. The owners thought of everything, from hand soap in the bathroom, to baking parchment in the kitchen - and everything in between!! 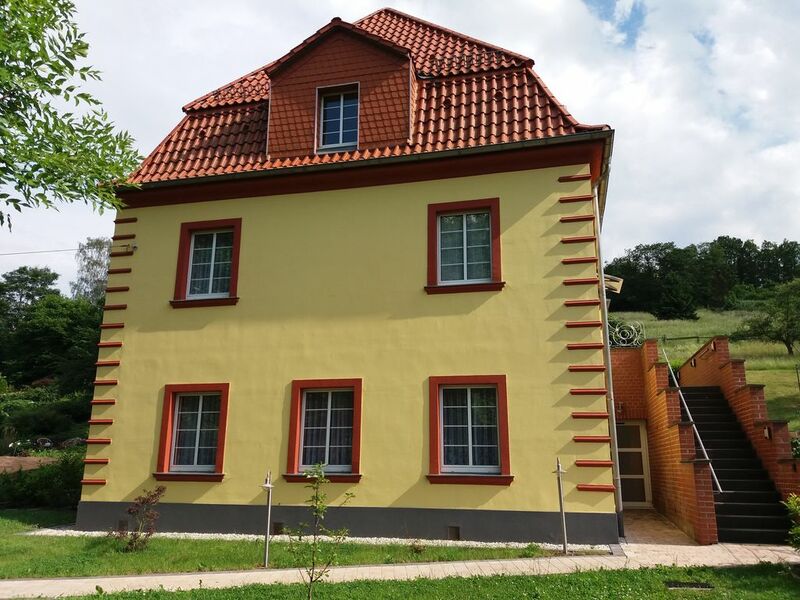 The apartment is situated in a lovely home on a picturesque hillside in Eisenach. It's close enough to the city to see the sights, yet maintains a country atmosphere that offers peace and tranquility. We loved eating on the sun porch, just outside the amazing kitchen. Everything was clean and well thought-out and made for an extremely enjoyable stay. The home/apartment is situated on a property that is not located on the Main Street. You need to go past the street entrance off of Katherinestrassse, turn right, go back by the shops and up the hill to find the parking lot below the house. From here, you need to walk up about 75 steps to get to the house on the hill. There are a lot, but you'll be grateful you did when you reach the top. It's a bit tricky to find and access, but look for the yellow house on the hill - above the garage rooftops on the left - and you'll see it. The apartment is worth it. Thank you, Herr Zedel! We truly loved our stay!! Wir haben uns pudelwohl gefühlt und kommen gerne wieder. The house was lovely and very comfortable. It was a little bit hard to find, as the instructions were in German and the English translation wasn't as clear. But once we found it it was a very comfortable stay and our host was very accommodating to all our needs! Danke! des appartements confortables et pour 4 - 6 personnes (lit d'appoint). 2 (3 à la maison 4) chambres séparées, salle de bains (2 salles de bains en appartement 4), cuisine (entièrement équipée), salon et terrasse / balcon directement à l'appartement. Bien que seulement 10 min. (Pied) du piéton (15 maison Bach u. Maison de Luther), se trouve d. Appartements à la lisière de la forêt. Idéal pour tous les touristes qui se promènent par ville, Nature u. Découverte de la culture. 20 min.-Walks Vous mènera à la Wartburg u. Promenades circulaires sur Drachenschlucht, Rennsteig et Burschenschaftsdenkmal. Unabhängig von der Aufenthaltsdauer werden 38,-€ für die Endreinigung zzgl. zum Mietpreis berechnet.